amazing…done in Robin’s egg blue repleate with speckled the soap looks lifelike. 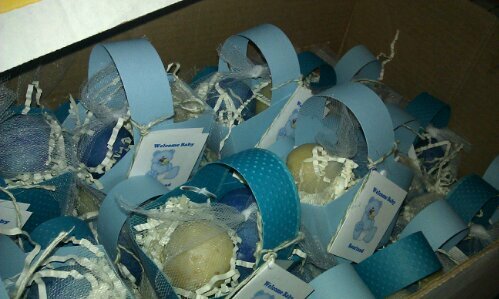 Well when word came of planning for my niece’s Cleveland baby shower you know I wanted to do something sweet for favors…..
Steve made a few batches of blue eggs in sweetgrass fragrance, and a few batches of yellow eggs in sunshine fragrance….and I put them together in little cardatock baskets I made. 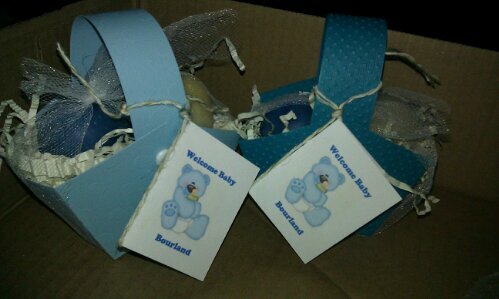 They nest in white crinkle, held in by a small tie of netting, and topped with a custom card. Last night I pulled them together to drop off with her step mom who is planning the shower. I hope they like em. My dining room ells amazing.